Almost all of its worth may come from only two of its algorithms, but the RMX16 is an accurate recreation of an 80s classic. 'That' 80s gated drum sound. Faithful reproduction of the original. Simple controls. Rich, warm. Ambience program. Limited editing possibilities. Only really useful for its Nonlin and Ambience programs. No modern additions or enhancements. 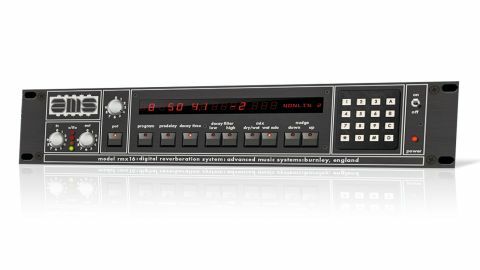 The latest addition to the UAD stable of plugins is a faithful model of the AMS RMX16 Digital Reverberation System, a classic British hardware reverb that was first released in 1981. "The general sound is characteristically thick and rich, sitting wholly in the realm of reverb 'effect' rather than natural space"
AMS RMX16 Digital Reverb (for UAD-2 and Apollo systems, VST/AU/RTAS/AAX) has been developed in conjunction with AMS founder Mark Crabtree, who, in designing the original, set out to produce something with an emphasis more on the musical than the technical, to which end much was tweaked by ear rather than measurement during development. The original RMX16 was a mono in/stereo out design, and the plugin version offers the same plus regular mono and stereo modes. The appearance of the GUI is unmistakable, right down to the "Burnley, England" legend and idiosyncratic 0-9/A-D keypad. The controls are minimal by modern standards. Input and Output level knobs are separated by an LED level meter. Next along is a multipurpose knob, assignable - along with the Nudge buttons and numeric keypad - to various reverb parameters by the buttons on the right. Activate the Program Selector button and you can use the Nudge buttons to scroll up or down through the RMX16's nine program algorithms or select them directly with the numeric keypad. The nine programs are Ambience, Room, Plate, two Halls, Chorus, Echo, Nonlin and Reverse. The short list of adjustable parameters comprises just Predelay, Decay Time, High and Low Filters, and wet/dry Mix. "The AMS Nonlin sound was central to 80s drum production, and AMS Neve has absolutely nailed it"
The general sound is characteristically thick and rich, sitting wholly in the realm of reverb 'effect' rather than natural space, and working very well in a popular music context. Back in the day - ie, the 80s - after Nonlin (see Nonlin drum), Ambience was the next most popular program. Its combination of plate and hall algorithms gives a thick, rich, warm tail that was over-used on those big bomb-dropping 80s ballad snares and works well for enriching vocals. The Chorus algorithm is useful for making a broad stereo signal from a mono input, but Reverse is overly coarse and grainy compared to other similar effects. The other, more orthodox programs - Plate, Hall and Room - tend to pale beside those of the RMX16's main digital rival, the Lexicon 224, and you'll probably already have your own favourites in these departments that won't be challenged by these. The AMS Nonlin sound was central to 80s drum production, and AMS Neve has absolutely nailed it. An A/B comparison with the original reveals that they're almost identical, the only audible difference being the noise of the hardware. While the lack of additional programs and extra parameters might be a disappointment to some, as far as we're concerned, it's enough that this piece of genuine audio history is now accessible to the UAD-owning masses.